I think there is truly something magical about how rosemary and garlic can come together. While this side dish does take a little bit of time to cook, its very low maintenance. Toss it all in a casserole dish and throw it into the oven. A little over an hour later – viola! A tasty side that is almost – I’ll reiterate almost – as good as mashed potatoes. 1. Clean potatoes and slice in half. Leave smaller ones whole if you wish. Melt your butter and crack garlic cloves and remove outer layer. 2. Add all ingredients into a medium sized casserole dish. The potatoes should be in one layer. Toss to coat the potatoes in butter. This was prior to butter being added. 3. Bake at 350 degrees for approximately one hour. 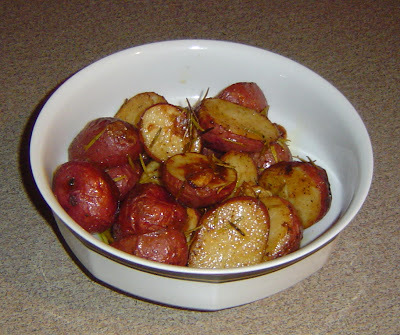 Once potatoes are fork tender, broil on high or an additional 10 minutes to brown. *Be sure to retain the infused butter for drizzling over top of the potatoes! Thoughts: These potatoes are great because you don’t need to peel them. Always a plus in my book. Once they are cooked, they take on a wonderful creaminess that really just melts in your mouth. The rosemary and the garlic add so much flavor to the dish. 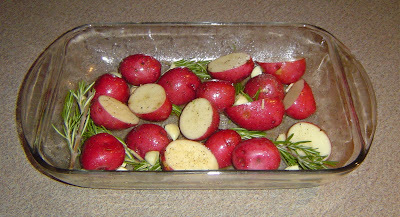 The rosemary is nice and woodsy and the garlic develops a deep roasted flavor. This would go really well with chicken, and the leftover potatoes would be great diced up and then pan fried for breakfast home fries. Now, it's time to try something new. thanks for the idea. Thanks for posting this, it was good!